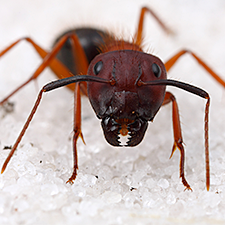 If you’re finding small sawdust piles and holes in the wood structure of your home and it’s not bees or termites, it might be carpenter ants. They do their damage when nesting and like all other wood-destroying insects, can weaken the integrity of your wooden structures. 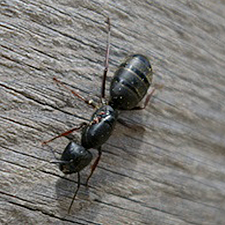 Larger than the normal ants, from ¼” to 1” in size. Have distinct coloring from black to orange to yellow to red, depending on the species. Winged ants are a sure sign that they are in mating season. Have elbowed antenna and pinched waistlines. Are Carpenter Ants in my Home? Carpenter ants nest in wood (they do not eat the wood) and can leave sawdust-like piles called “frass” they create when making “gallies” in wood around the household, including the frame of the house. Carpenter ants rustle and/or scratch within the walls of your home as they communicate and create their nests. Seeing carpenter ants swarm when winged reproductives emerge from the nest to begin new colonies. 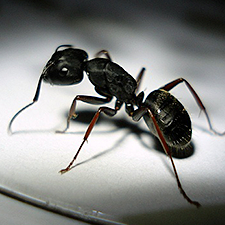 Spotting a carpenter ant scavenging for food or similar necessities inside or around your house. Keep in mind that you typically only see 5% of the total number of carpenter ants around your home.